Naypyidaw, also known as Nay Pyi Taw, has been the capital of Myanmar since 2005, is administered as the Union of this country. With the ideal situation – being in the center of Myanmar, Naypyidaw is reachable from every part of the Union. The capital which is approximately 300km from Mandalay and 400km from Yangon surrounded by 8 townships namely Zeyar Thiri, Pohbba Thiri, Uttara Thiri, Zabu Thiri, Dekina Thiri, Pyinmana, Lewe and Tatkone Townships. It’s around 30 minutes to get to Naypyidaw Airport from the capital city, where offer day-to-day flights from Naypyidaw to Yangoon the commercial centre, and Mandalay the cultural one. Thus, Take Naypyidaw tours is now easier than ever thanks to various flights to tourist attractions such as Bagan, Heho, Sittwe, Myitkyina, Kyaing Tong and many others. Draw a day during your Myanmar tour program to visit the administrative capital will be great to understand more about this strange country. Located on the main Yangon-Mandalay rail line is the Naypyidaw Station, which provides nine-hour trips to Naypyidaw from Yangon. 10 miles southeast of the city situated the Naypyidaw Airport, where all domestic airlines are offered. To access to Yangon and other cities along the country, there are periodic flights with Air Bagan, Air Mandalay, Myanma Airways and Yangon Airways. If the airplane is not the ideal means of transportation, now visitors can enjoy themselves driving for 4 hours to Naypyidaw from Yangon via a new highway opened lately. One of the particularly noticeable Land Marks of Naypyidaw is City Hall, where the headquarters of Naypyidaw Development Committee is established. All the missions for development of this capital are in charge of the headquarters. National special events take place under the traditional tune of National Anthem played by State Orchestra in Naypyidaw City Hall. That indicates Naypyidaw, administrative City of the Union of Myanmar. Myanmar International Convention Centre (MICC) is situated on 16 acres of land with 312, 000 square feet in Zabuthiri Township, Naypyidaw. It was completed on 15 March 2010 under the construction of People’s Republic of China. The convention center which has in it listening rooms, holding rooms, meeting rooms, VIP summit room, news briefing room, singing room and Banquet Hall with the capacity enough for 720 persons, can also be a domicile of up to 1900 persons. We are Vietnamese. I and my wife, will go to Naypyidaw, Myanmar in 21 October (at midnight) and return to Yangon at 18h (22 October). We would like to book One day sighseeing Tour of Naypyidaw. Can you help us to inform the itinerary, price of this tour? We prefer a English speaker driver only (base level), no need guide. Thank you for letting us know about your travel plan. We have dropped a detailed quotation on Naypyitaw one day tour to your email already. Please check it and let us know if you have other questions. Since the newborn capital city of Burma is relatively new for all tourists, not many travelers consider Naypyidaw as one of the main Myanmar tourist attractions. 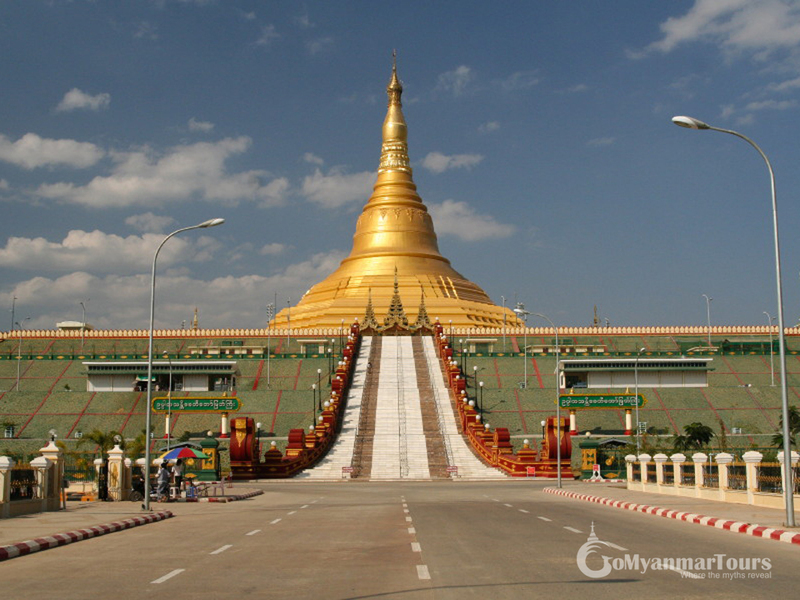 Nevertheless, a Naypyidaw tour still offers you fun things to experience. If you are wondering what to do and see in Naypyidaw, keep scrolling to find out! The 165-acre park of Naypyidaw with full of flowers, trees, and plants is an ideal place to see during your Naypyidaw tour. Located in the convenient adjacent to the National Herbal Park and the City Hall, the park is easy to access to witness the display of 13 dazzling water on the main pond includes three fountains and 11 small ponds. Here comes the best time to see how fancy is it in the evening when the water emerges in the colorful lights. Additionally, it is able to spend time in the park to wander around three small gardens with lush trees, gaze out at the 9.1 meters high and two stone gardens. Uppatasanti Pagoda is the prominent landmark in Naypyidaw. Undoubtedly, this is where for tourists to head off in every Naypyidaw tour. It was constructed in 2006 and completed in 2009 with 325 feet high became the dignified symbol of the capital city and the area is just 30 cm shorter than the legendary Shwedagon Pagoda in Yangon. In the precinct of the pagoda displays impressive religious edifices and 108 feet high flagstaff. Tourists come to the pagoda can enter the stupa to marvel at the large space with marble slabs on the walls. Myanmar is widely known for its massive gem and jade. Once taking a Naypyidaw city tour, Naypyidaw is an exciting place let you see the variety of precious jewels such as sapphire and ruby. Located in Zabuthiri Township, the Gem Museum is embraced by the pretty garden and decorated with modern designs. Except for Monday and Government holiday, tourists are free to visit the museum from 9:30 am to 4:00 pm.